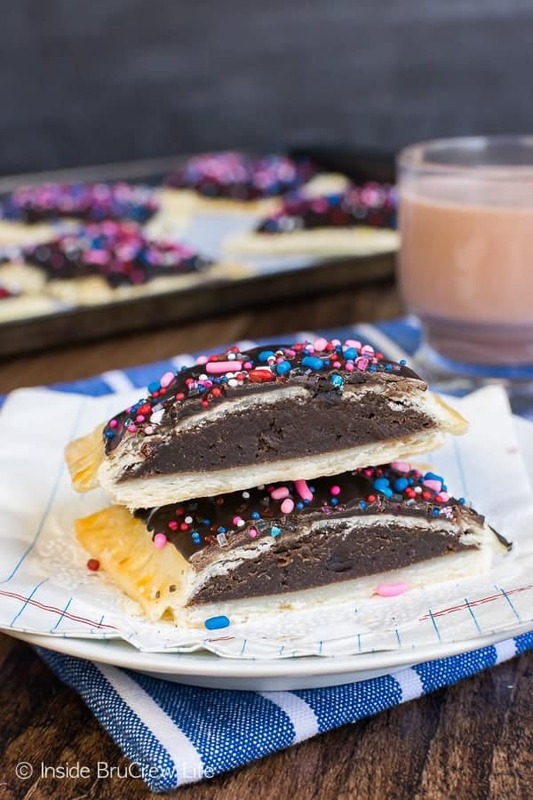 These easy Brownie Cheesecake Breakfast Tarts are a delicious pastry you can make yourself. A sweet brownie center, chocolate frosting, and sprinkles will get the morning started off right. This post was brought to you by the makers of Promised Land Dairy for the #FarFromOrdinaryMilk campaign. I received compensation to write this post through the Far From Ordinary Milk program. All opinions expressed are 100% my own. I can remember my parents buying us boxes of store bought pastries to grab on our way out the door for school many, many years ago. Back then there were only a few flavors to choose from on the store shelves. Of course, I always grabbed the chocolate ones. To this day, I will always go for anything chocolate over fruity. Our kids are no different. If we have strawberry pastries and s’mores pastries in the pantry, can you guess which one will still be sitting there a week later? We are almost two months into our school routine now. Can I get a big amen about that? There is something so comforting about having a routine and knowing what is going to happen each day. 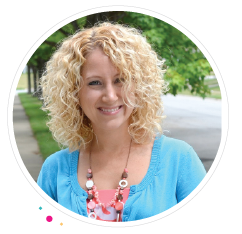 Yes, there are always surprises that come up from time to time, but for the most part we have a routine. One thing that I have been trying to do more often is to create fun new grab and go breakfast treats. 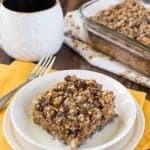 These skinny peanut butter granola bites are fun little treats that our kids love to have on hand for easy breakfast or after school snacks. But there are days that I want to create something easy, but fun and different. Enter in the breakfast tarts! This fall I have the awesome opportunity to work with Promised Land Dairy sharing new and inventive recipes using their milk. You guys! Their Midnight Chocolate Milk is amazing. 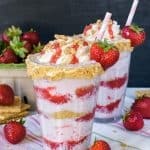 It is rich and creamy and tastes just like melted ice cream. For real. Promised Land Dairy provides creamy milk made from unique Jersey cows. Their milk is free from artificial colors, flavors, and hormones. This naturally delicious milk is just what I want my growing teenagers drinking. If you are craving something sweet, grab a glass of midnight chocolate milk and start chugging. 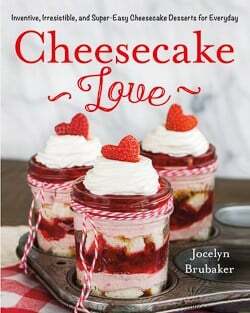 Or you can add it to your favorite dessert or breakfast recipes like I did. 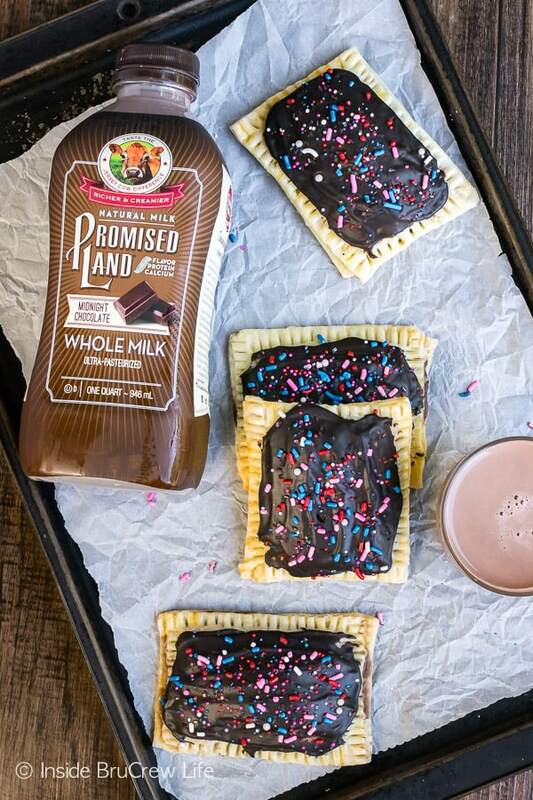 I couldn’t wait to include that amazing chocolate milk into these fun breakfast tarts. 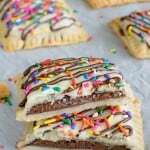 This idea for a brownie stuffed breakfast pastry has been swirling around in my head for some time now. I’m glad I waited to put it together though because adding the rich chocolate milk to the brownie batter and frosting was perfect! 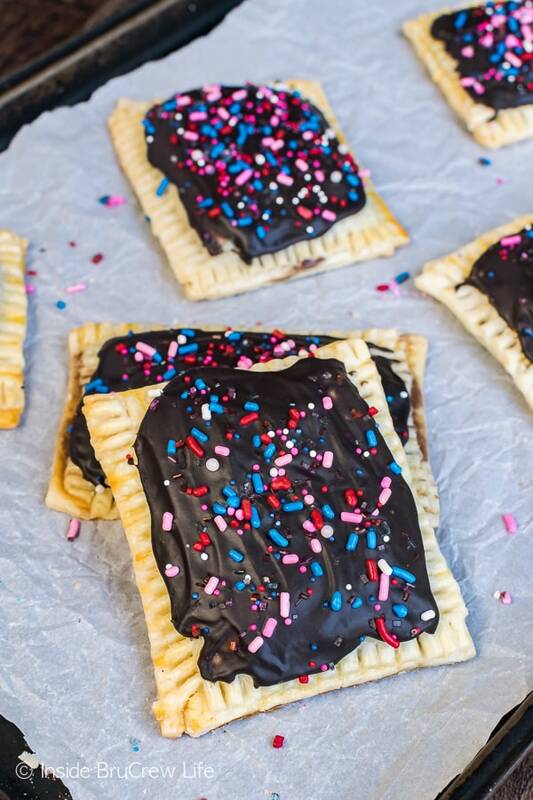 Also, any morning that involves chocolate and sprinkles for breakfast is perfect in my mind. Here are a few tips to help you get started on your own brownie cheesecake breakfast tarts. Set your cream cheese out at least 30 minutes before you get started. If you forget, unwrap it and microwave it for about 15 seconds. Beat the cream cheese, dry brownie mix, and midnight chocolate milk until it is nice and creamy. Place both the piecrusts on your counter and cut each one into 8 rectangles that are 3×4 inches. You will need to keep the edges and roll them out to get a total of 16. Place 8 pie crust rectangles on a baking sheet and divide the brownie cheesecake mixture evenly onto the middle of each one. Spread it out slightly, leaving an edge all around. Gently place the other 8 pie crust rectangles on top of the filling. Use a fork to crimp the edges of the pie crust all the way around, so the filling does not leak out. Brush on an egg wash before baking. This helps your tarts to get a nice golden color in the oven. 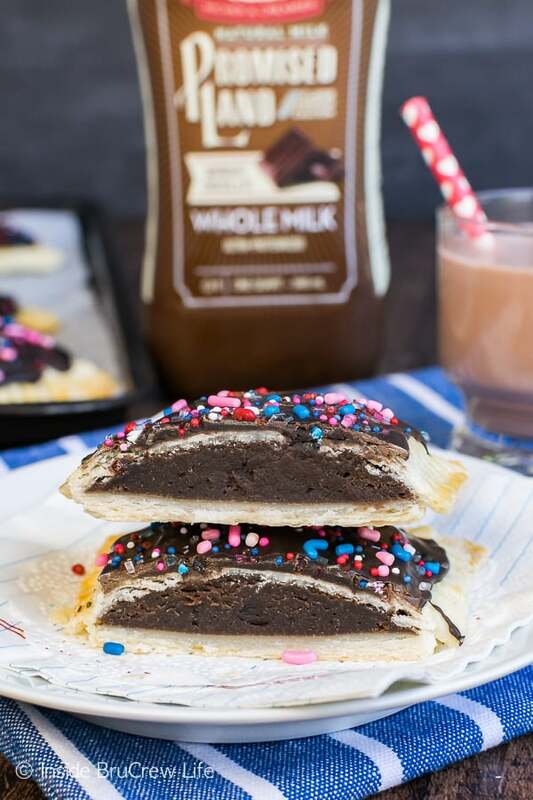 Whisk together the powdered sugar, cocoa powder, and more midnight chocolate milk until a creamy glaze comes together. You may need to add a few more drops of milk to get it to a spreadable consistency. 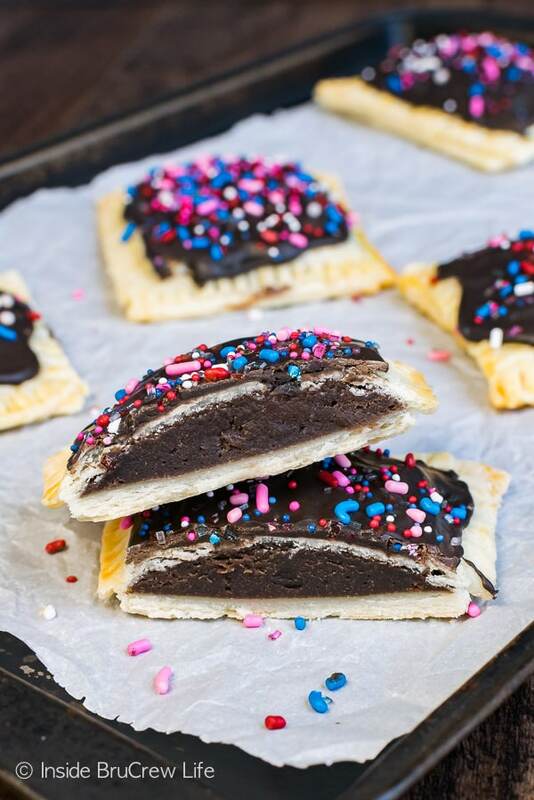 Spread the glaze on top of the cooled tarts with a knife and add lots of fun colored sprinkles. 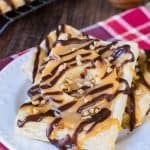 Stand back and watch your children’s eyes get wide with excitement when they see that mom made a fun new breakfast treat that they can grab in the morning. 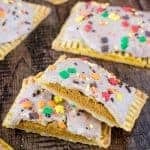 Who needs store bought pastries when you can make your own unique flavor combos at home. Am I right? 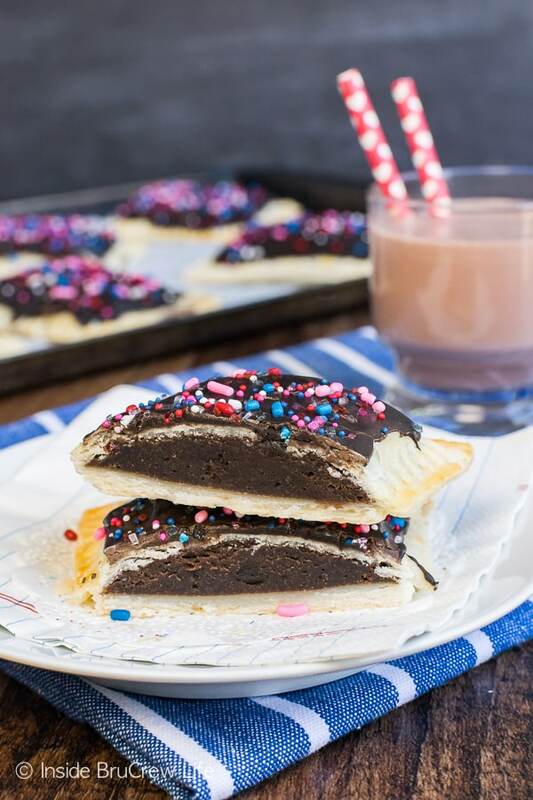 These easy Brownie Cheesecake Breakfast Tarts are a delicious pastry you can make yourself. A sweet brownie center, chocolate frosting, and sprinkles get the morning started off right. Beat the cream cheese, brownie mix, and milk until it is creamy. 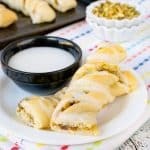 Unroll the pie crust and roll out slightly. Cut 6 rectangles that are 3 inches by 4 inches from each one. Reroll the pie crust scraps and cut out 4 more rectangles making a total of 16 rectangles. Place 8 pie crust rectangles on a cookie sheet. Spoon the brownie batter evenly into the middle of each one. Use the back of a spoon to spread it out slightly leaving a border around the edge of each rectangle. Place the remaining 8 pie crust rectangles on top of the batter. Press the sides slightly with your fingers. Use a fork to crimp the edges together. Whisk together the egg and water and brush on top of the tarts. Bake for 20 minutes. Remove and cool. Stir together the powdered sugar, cocoa powder, and milk until spreadable. You may need to add a few extra drops of milk. Spread the glaze on top of the cooled tarts with a knife. Add lots of fun colored sprinkles. Let set. Store in a loosely sealed container. What to use if you can’t find that milk? You can check here to see if a store in your area carries the milk. http://www.promisedlanddairy.com/find-us/find-a-store/? If there is no one in your area, you can use any chocolate milk in place of it. Chocolate for breakfast is always a win! This decadent Brownie Cheesecake Tarts would be perfect for Christmas morning snack!